Certainly the most important function of the brain is the receipt, transmission, and processing of information. For this reason, much of our knowledge about neurons has to do with their signaling capabilities. Nevertheless, neurons are cells, and some of their most important functional properties arise from their cellular characteristics and from cell-cell interactions that are not directly related to signaling activities. For example, we tend to think of synapses as specializations for modulating activity of the receiving cell, that is, for the transmission of excitation or inhibition. Synaptic contacts play other important roles, however, in determining the structure, functional properties and very existence of the cells that they contact. These trophic or regulatory functions are of immense importance for understanding the consequences of injury or disease to the nervous system, since damage or disease at one site can result in a cascade of effects throughout the nervous system as a result of loss of intercellular regulation. 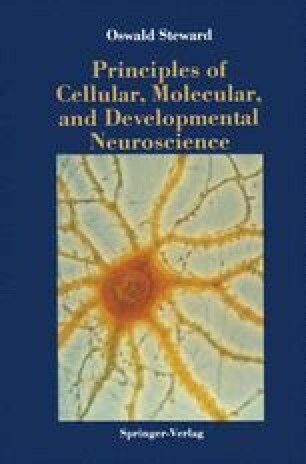 This chapter considers neurons from a cellular perspective, focusing on those aspects of cellular existence that are unique in neurons or that figure importantly in neuronal function.